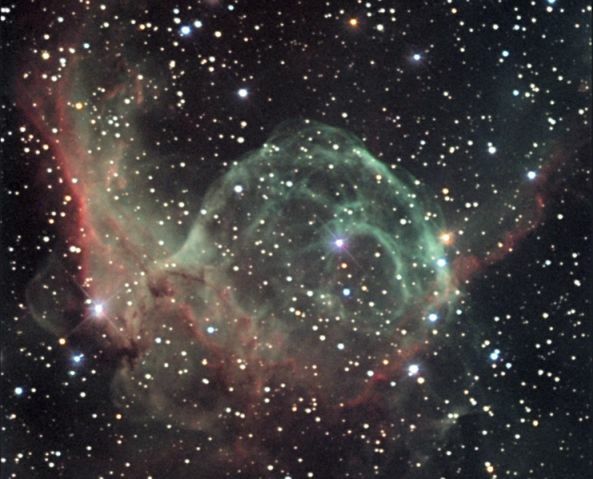 Explanation: NGC 2359 is a striking emission nebula with an impressive popular name - Thor's Helmet. Sure, its suggestive winged appearance might lead some to refer to it as the "duck nebula", but if you were a nebula which name would you choose? By any name NGC 2359 is a bubble-like nebula some 30 light-years across, blown by energetic winds from an extremely hot star seen near the center and classified as a Wolf-Rayet star. Wolf-Rayet stars are rare massive blue giants which develop stellar winds with speeds of millions of kilometers per hour. Interactions with a nearby large molecular cloud are thought to have contributed to this nebula's more complex shape and curved bow-shock structures. NGC 2359 is about 15,000 light-years distant toward the constellation Canis Major.